What’s up with the perspective? And why are they wearing playing card shirts? 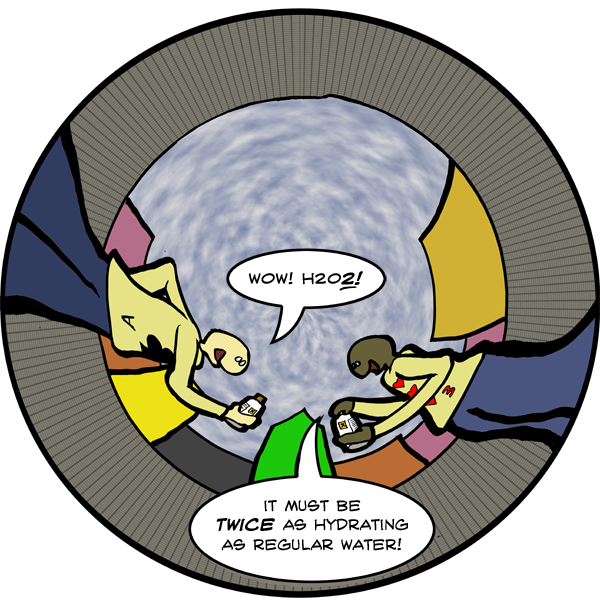 Why would it be twice as hydrating when it contains half as much hydrogen? Well, let’s see. There’s H2O, and then there’s H2O*2*, which must be new and improved! so good you’ll foam at the mouth for it! Wow freaky that I just looked this compound up on wikipedia before checking your comic Luke! What about that comic: http://www.lukesurl.com/comics/2009-07-29-ice.gif? The only thing better would be H20 2.0…. dihydrogen dioxide! ITS A KILLER! Do not google hydrogen peroxide enema. or, you know, you COULD just expose it to heat and/or light, in which case a radical reaction will break down the O-O bonds, and then those radicals would result in water with oxygen dissolved in it. Until the oxygen “bubbles out” of the liquid. but, H2O2 would have twice as much /oxygen/, not hydrogen. …or is that the joke?